Singapore-based Crescentrating, a global authority on Halal travel, has released the world’s first glossary with a wealth of terminology used in the Halal travel market. Over 150 terms and concepts have been entered and validated with regular updates planned as the market matures. Users can obtain a quick list of terms through the glossary which has been divided into sections for easy navigation. It has been published as a free downloadable e-book with plans to make it an online resource in the near future. With halal travel now worth billions annually, the need to understand these terms is becoming more important as the industry aims to capitalise on a sector projected to be worth $200 billion by 2020. “With an increasing number of destinations and services looking to attract Muslim traveller, there is a need to better understand the terms used to describe the market needs and practices related to this segment,” he said. 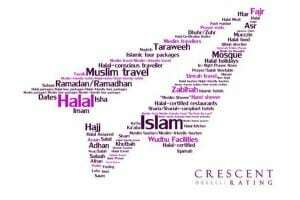 The glossary includes terms which provide an overview of Halal travel and its core values. Each of these has been defined in the context of lifestyle and travel.